Esoteric Antenna is proud to announce the release of the eagerly awaited new studio album by the legendary JACK BRUCE, one of the greatest popular musicians Britain has ever produced. A supremely talented instrumentalist and vocalist, eminently respected by his peers, Jack's pioneering bass playing style has influenced successive generations of bassists, including such luminaries as Paul McCartney, Jaco Pastorius and Sting, alongside more contemporary musicians such as Flea of the Red Hot Chilli Peppers. He is also the possessor of one of the most powerful voices in modern music and a composer of some of the most original and influential music of the past forty-five years. As a songwriter he has written some of popular music's enduring classics such as 'Sunshine of Your Love', 'White Room', 'I Feel Free' and 'Theme from an Imaginary Western'. "Silver Rails" is Jack's first studio in ten years, recorded at the world famous Abbey Road studios. Produced by Rob Cass, "Silver Rails" is a splendid collection of carefully crafted songs written in partnership with lyricists Pete Brown, Kip Hanrahan and Margrit Seyffer. He is joined on the album by a host of celebrated instrumentalists including Phil Manzanera, Robin Trower, Bernie Marsden, Uli Jon Roth, John Medeski, Malcolm Bruce and Cindy Blackman Santana. "Silver Rails" is the next chapter in the recorded legacy of one of popular music's most respected innovators. Guests musicians on the album include Phil Manzanera, Robin Trower, Bernie Marsden, Uli Jon Roth, John Medeski, Malcolm Bruce and Cindy Blackman Santana. Jack has written some of popular music's most enduring classics such as Sunshine Of Your Love, White Room, I Feel Free and Theme From An Imaginary Western. This is the most fully realized album of Bruce's career, at least to my ears. There are eight songs of utter brilliance, and when was the last time that happened? This is maybe the best solo album Jack Bruce has yet completed, and who could have hoped that in 2014? Rock Ain't Near Dead. 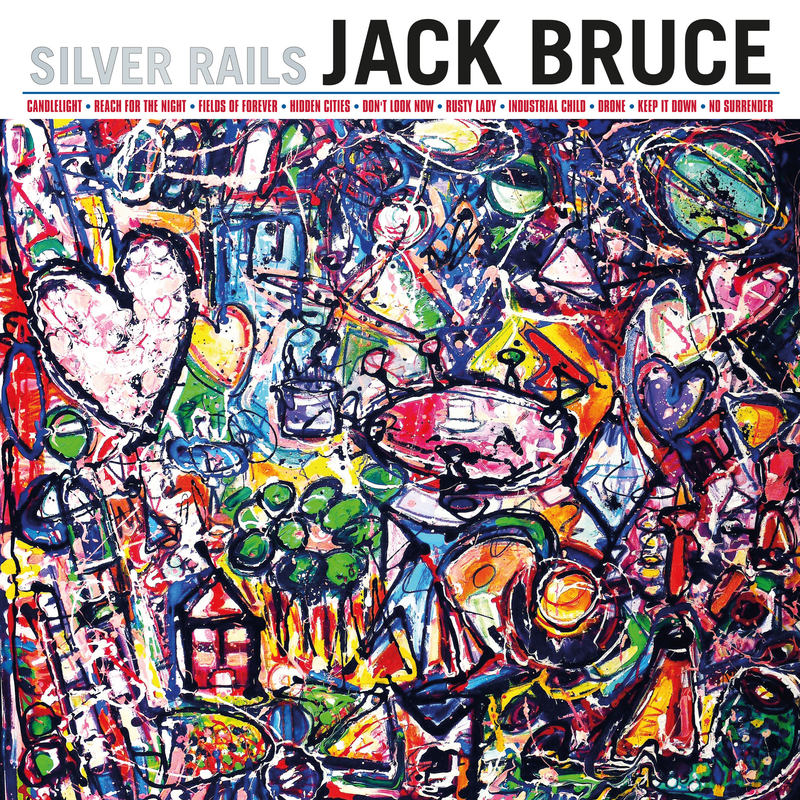 Silver Rails runs from expressive to edgy with its insightful lyrics, solid musicianship and solos - a fine record and another silver lining for the legendary Jack Bruce. A well crafted, ethereal album that rocks, and is the cream of the solo crop by iconic musician Jack Bruce! Showcases this Rock & Roll Hall of Fame icon at his best, packed with wonderful songs that navigate a wide stylistic terrain and leave an indelible lasting impression. Bruce sings with intense fervor and explores the very limits of improv, rock, jazz, and blues. The deep grooves laid down for Silver Rails handily prove that Bruce can still deliver the cream straight up and fresh.